It's similar to dodgeball but with foam-tipped arrows! HOW TO PLAY: Two teams, consisting of 5 players each playing opposite one another, are separated by a “safe zone.” Each team also has what we call a “5-Spot Knockout Target.” There are two objectives: 1) to tag the opponents, and 2) to knock out the five discs of the opposing team’s target. You eliminate a player by tagging him or her with an arrow, or by catching his or her arrow. The 5-Spot Targets work to save a “life” of one of the players. A “tagged” player can be called back into the game when a target spot is knocked out or when a teammate catches an arrow. 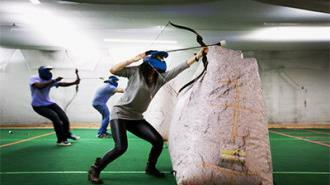 ***Unlike some other sports, the only safety equipment required to play Archery Tag® is a facemask. Players experience virtually no pain when “tagged” with our Archery Tag® arrows.